Spacious Fully Equipped Luxury Accommodation For The Perfect Holiday. Our prestigious five bedroom luxury villa is located on one of the most beautiful and well maintained vacation developments in the Disney area, Calabay Parc at Tower Lake. The development is gated and has 24 hour security for extra peace of mind. We are located just off Highway 27 which is only 15 / 20 minutes from Disney, Universal and only 2 minutes from local shops such as Wal-Mart, Publix as well as restaurants and bars. For the keen golfer there are over 100 top class golf courses within 30 minutes. Our property has five bedrooms two of which are on the ground floor, both of these bedrooms have UK king sized beds and en-suites. Also located on the ground floor is the living room with big screen TV, den which can also be converted into a 6th bedroom, fully equipped kitchen with breakfast area, dining room and games room with pool table and air hockey which is great for keeping the children occupied after a long day at the parks. To the upper floor we have bedroom three which has a king sized bed and en-suite. Bedroom four has a double bed with jack and gill bathroom which is shared with bedroom five which is our Disney themed bedroom with two single beds. Also included within our villa is a childs highchair, cot which also converts into a playpen. We have cable TV in all of the bedrooms as well as the living room, den and games area. Our property is also fully air conditioned. As well as our games room we also have a games area with cable Tv, Playstation 3 and several board games and DVD’s. Our property has FREE high speed wifi internet and telephone calls included. Our villa has its own private swimming pool and Jacuzzi with external bathroom & shower which is fantastic for relaxing at the end of a busy day at the parks. For those guests who prefer a slower paced holiday you can sun bath on the pool deck or take a walk down to tower lake. We have an excellent Management Company who keep the villa to a high standard of decoration and cleanliness and who are on call 24/7. Please contact me if you need any further information on the villa or the surrounding area. Master Suite 1 has a superb bathroom with his n hers basins and extra large vanity area with marble tops, large oval bath and spacious walk , in shower. It also has large makeup area with theater mirrored lighting. Master Suite 2 also has large walk in shower and luxury fittings. Bathrooms 3 and 4 have over bath showers. Bathroom 5 is an outdoor bathroom for when using the pool, it has a toilet and its own shower. Our villa has a telephone line installed. The phone package we have allows guest to make local and international calls. Our laundry room has a large washing machine and a separate dryer. Our garage has been converted into a games room. Our villa has wireless broadband which is free for guests to use. A large selection of towels will be provided for each bedroom for the duration of your stay. We also have a large selection of beach towels for guests to use. Our villa has a dishwasher and waste disposal unit installed. Our kitchen is fully equipped and includes a hob, oven, microwave, fridge freezer with integrated ice and water. Our villa has 8 televisions in total one in all bedrooms, the lounge, den and games area. Cable television is installed throughout our villa. Our local golf course is Southern Dunes and is only a 2 minute drive away from the villa. Our property is wheel chair friendly on the ground floor only. There is a small lip as you come through the front door and also out to the pool area. The garage is converted into a Games Room with full size pool table, air hockey table and dartboard. There is also a Play Station 3 system as well as plenty of board games, books and pool toys. Wonderful Stay great rental for the price!! It was close to where we were going and it was close to many other places also. It was very nice and cozy there my family and I enjoyed the stay and it was spacious. It was ok need some furniture replacing and some maintenance done because of that will be a 3 star. This stunning spacious 5 bedroom 4 & 1/2 bathroom villa was completed in November 2007. Set in the prestigious estate of Calabay Parc, Tower Lake. 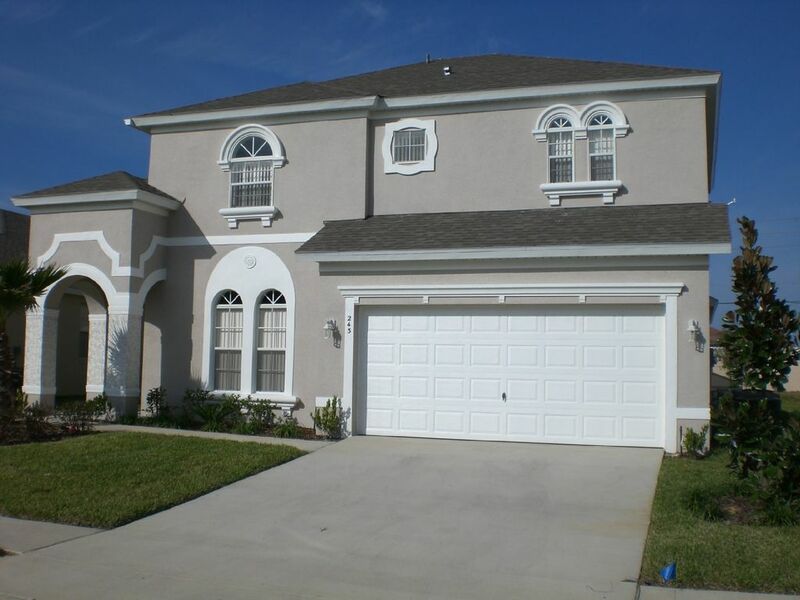 This gated community is in a lakeside setting, conveniently located close to large supermarkets, countless restaurants, many high acclaimed golf courses , not to mention the shopping malls, out-lets stores, theme parks and much more....and in less than 15 minutes away, you can be at the main gate of Walt Disney World. Our luxury villa is complimented by having its own private south facing heated swimming pool and Jacuzzi. Situated at Calabay Parc, Tower Lake you are welcomed with a magnificent gated entrance.